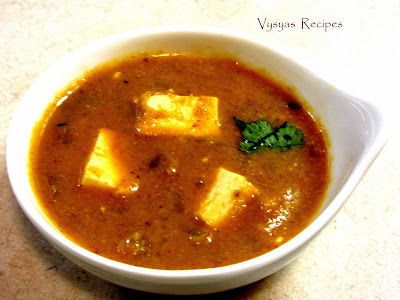 Paneer Korma is a best accompaniment for Chapathi, Dosa,Rice, Roti and Mild Pulov Varieties.Paneer with korma gravy taste fabulous. Paneer is a great source of calcium, which is helpful in maintaining strong teeth and bones. Due to its low lactose content, it protects the teeth against harmful sugars. Paneer. contains Vitamin D, which along with calcium, facilitates in preventing cavities and wearing down of the tooth enamel. Hence, regular consumption of cottage cheese is helpful in preserving good dental health. Paneer is also known to enhance blood. Paneer promotes strong bones and also helps to prevent and reduce back and joint problems.Now we learn to make simple Paneer Korma. Cut the paneer into cubes. if it store bought put it in hot water for few minutes, till it soft. Melt the butter,add fennel seeds and green chillies saute till you get good aroma(Smell) from fennel seeds and till chillies turn pale color. Add Onions saute till it turns pink, then add Ground paste with needed water according to consistency. Let it boil well for 15 minutes, till the raw smell goes.Add salt mix well. Now, Keep the flame to low, then add cubed paneer, cook for 5 - 7 min, till everything combines well, and it gets gravy consistency.Then remove it from flame. Garnish with fresh cilantro. It goes very well all types of Indian breads , rice and dosa. I tried, it came out very well. Thanks.